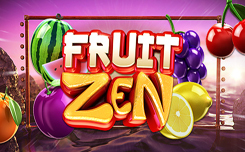 Fruit Zen is an incredibly popular slot among players, which simply captivates with its colors and soundtrack. The game was created by one of the most popular Betsoft companies and was launched in 2014. Fans of the slots of this software instantly allocated this game from all the slot machines of the company. But what exactly is the feature of this slot machine, which continues to show high popularity rates, even after several years. The first thing you should pay attention to is the design of the slot machine, which stuns with its colors and beautiful design and thanks to which you immerse yourself in the world of all your favorite fruits, and the World Ocean with rocks will be the backdrop for the game. According to some sources, you can learn that the word Zen has its roots deep in China and implies a state of meditation, it is this state that you can feel playing in the slot of fruit zen. The process of the game itself also has an excellent and beautiful animation, and when the Fruit Zen symbol appears on drums 2,3 and 4, you will get a whole drum with wild symbols that will replace any matched symbol and increase your chances of winning. The symbol can appear on a maximum of three reels, and give the player up to three free spins, thereby compensating for the lack of bonus games in the slot. The gaming machine has 10 game lines that operate in two directions, from right to left, and from left to right.